He says, “I think probably underpinning all that I’ve had the privilege to do is building relationship with these countries in the Pacific. Certainly the relationships we have with countries like Japan, Korea, Singapore, the Philippines, Thailand, Indonesia, and India are hugely important to, not only our security, but also our economic prosperity. “I think that one particular effort sort of underpins all the rest that I’ve done,” he adds. In this Greater Good interview, Admiral Fargo talks about the challenges and elations he has undergone as commander of the US Navy Pacific Command. He also shares how he utilized his Navy experience in his transition from the military to the corporate world. He explains the differences and similarities of handling military personnel and corporate employees. Listen now and find out why Admiral Fargo decides to further his working experience after 35 years in the Navy, and why he urges military personnel to give back to the Hawaiian community. Admiral Tom Fargo USN (Ret. ), former Commander of the U.S. Pacific Command, serves as Trex Enterprises’ President and Chairman of Trex’s subsidiaries—Loea Corporation, a high-speed, high-bandwidth Communications Company, and Sago Systems, Inc., a defense and homeland security company developing state-of-the-art security technologies. Admiral Fargo joined Trex Enterprises on March 28, 2005, after a distinguished career serving the U.S. Navy and the Department of Defense. He was the twentieth officer to hold the position of Commander of the U.S. Pacific Command. As the senior U.S. military commander in East Asia, the Pacific and Indian Ocean areas, he led the largest unified command while directing the joint operations of the Army, Navy, Marine Corps and Air Force across 100 million miles. He was responsible to the President and the Secretary of Defense, and was the U.S. military representative for collective defense arrangements in the Pacific. Admiral Fargo also served as the 29th Commander-in-Chief of the U.S. Pacific Fleet from October 1999 to May 2002. His service as a leader in the Pacific was preceded by his command of the U.S. Fifth Fleet and Naval Forces of the Central Command during two years of Iraqi contingency operations from July 1996 to July 1998. His 35 years of service included six tours in Washington, DC, in addition to five commands in the Pacific, Indian Ocean, and Middle East. Born in San Diego, CA, he attended high school in Coronado, CA, and Sasebo, Japan. Admiral Fargo graduated from the United States Naval Academy in June 1970. He is a 1989 recipient of the Vice Admiral James Bond Stockdale Award for Inspirational Leadership. Admiral Fargo is based out of Trex’s Honolulu, Hawaii, office. In addition to his work at Trex, he serves on the Boards of Directors for Hawaiian Electric Industries, Hawaiian Airlines, the Japan-America Society, and the Iolani School Board of Governors. 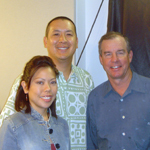 In January 2006, he was appointed to the Hawaii Pacific University Board of Trustees. He is the National Vice Chairman of the Pearl Harbor Memorial Fund. Admiral Thomas Boulton Fargo assumed duties as Commander, U.S. Pacific Command, at Camp H.M. Smith, Hawaii, on May 2, 2002. He is the twentieth officer to hold the position. As the senior U.S. military commander in the Pacific and Indian Ocean areas, he leads the largest of the unified commands and directs Army, Navy, Marine Corps and Air Force operations across more than 100 million square miles. He is responsible to the President and the Secretary of Defense through the Chairman, Joint Chiefs of Staff and is the U.S. military representative for collective defense arrangements in the Pacific. Born in San Diego, Calif., in June 1948, Admiral Fargo attended high school in Coronado, Calif., and Sasebo, Japan, and graduated from the United States Naval Academy in June 1970. Trained in joint, naval and submarine commands, Admiral Fargo has served in a variety of sea and shore duty assignments. At sea, his five assignments in both attack and ballistic missile submarines included Executive Officer aboard USS Plunger (SSN 595) and Commanding Officer of USS Salt Lake City (SSN 716). He served as Commander, Submarine Group SEVEN, Commander Task Force SEVEN FOUR, and Commander Task Force ONE FIVE SEVEN in the Western Pacific, Indian Ocean and Arabian Gulf from 1992 to 1993. He commanded the United States FIFTH Fleet and Naval Forces of the Central Command during two years of Iraqi contingency operations from July 1996 to July 1998. Admiral Fargo served as the 29th Commander in Chief, U.S Pacific Fleet from October 1999 to May 2002. Ashore, Admiral Fargo has served in the Bureau of Naval Personnel and with the Commander in Chief, U.S. Atlantic Fleet and has had multiple assignments in the Office of the Chief of Naval Operations. Since his selection to Flag rank in 1994, Admiral Fargo has served as Director of Operations (J-3), U.S. Atlantic Command during the Haiti intervention; as Director, Assessment Division (N-81) for the Chief of Naval Operations; and as the Deputy Chief of Naval Operations for Plans, Policy and Operations (N3/N5). Admiral Fargo is a 1989 recipient of the Vice Admiral James Bond Stockdale Award for Inspirational Leadership. His personal decorations include the Distinguished Service Medal (four awards), the Defense Superior Service Medal and the Legion of Merit (three awards).